We have entered the final straight with the massive UI overhaul. The intensive final tests have been started few days ago, so the players can expect implementation of reworked inventory and guilds system, alongside with the new NPC shops interface, within the very next few weeks. The update greatly increases the game’s interface functionality while making it much more user-friendly, as it introduces numerous features requested by our players, i.e. 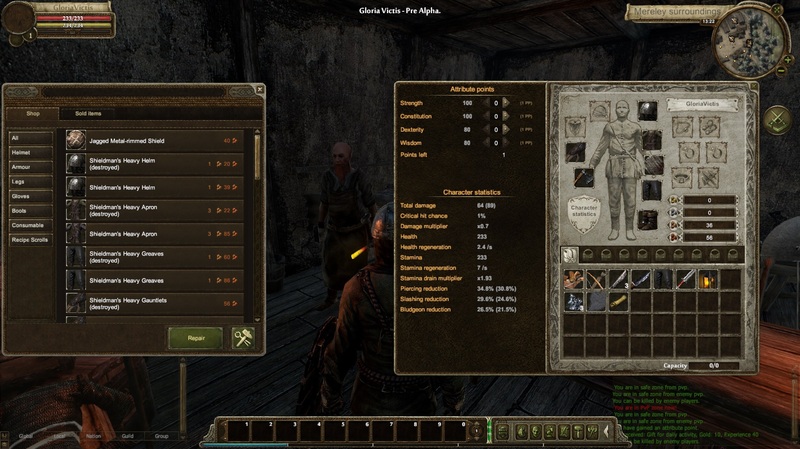 an ability to expand the inventory space with additional bags and backpacks, a buy-back tab and the assortment filters in NPC shops window or a mouse-mode toggle. A character’s statistics tab also have been refreshed, becoming more intuitive, as well as the guilds management window – once the update have been applied, players will be able to comfortably create their fractions. With implementation of this update, due to the database structure changes there will come a long-time awaited full wipe of characters. This is a great chance to join the game, as everyone will have a fresh start and servers will become much more populated. Meanwhile we are reworking the buffs system – when it’s done, we will be able to implement the alchemic recipes, the weather system’s impact on the characters and the heroes system, which will reward the most active players from each nation. The next step of improving the user experience will be reworking the crafting system, implementing the inheriting of the final product’s properties after the specific materials used by a crafter. We would like to thank very much all players who are helping us in testing this massive update!